I love putting containers together and saw some especially beautiful ones this spring that stopped me in my tracks. I did not create them, but I wished I had! I took pictures and thought maybe one day I would duplicate them. I am constantly amazed at what others put together so creatively. Like a canvas waiting for paint, containers are seasonal so you can experiment and go wild with your colors and combos and try something else next year. The one above would be for shade. 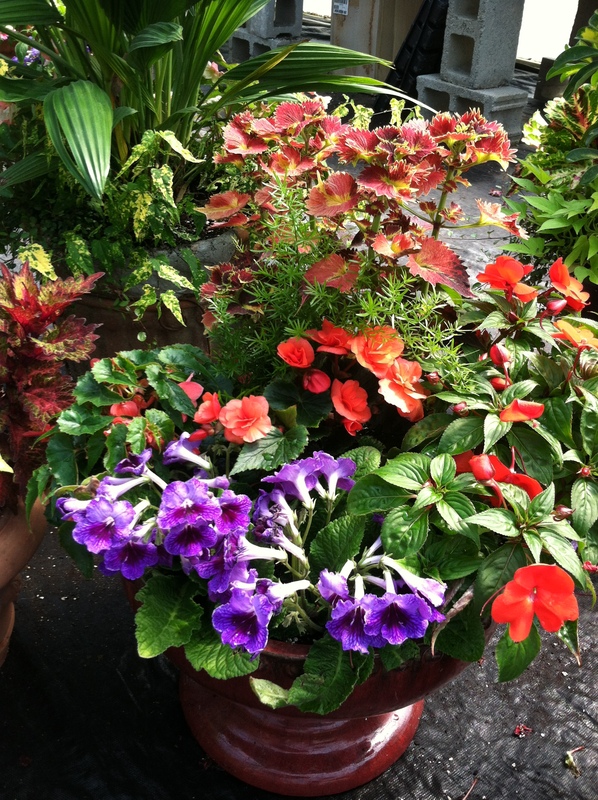 Who says a shade container has to be uninteresting and not colorful like sun ones? I would rather create a shade or partial shade container than a full sun one. 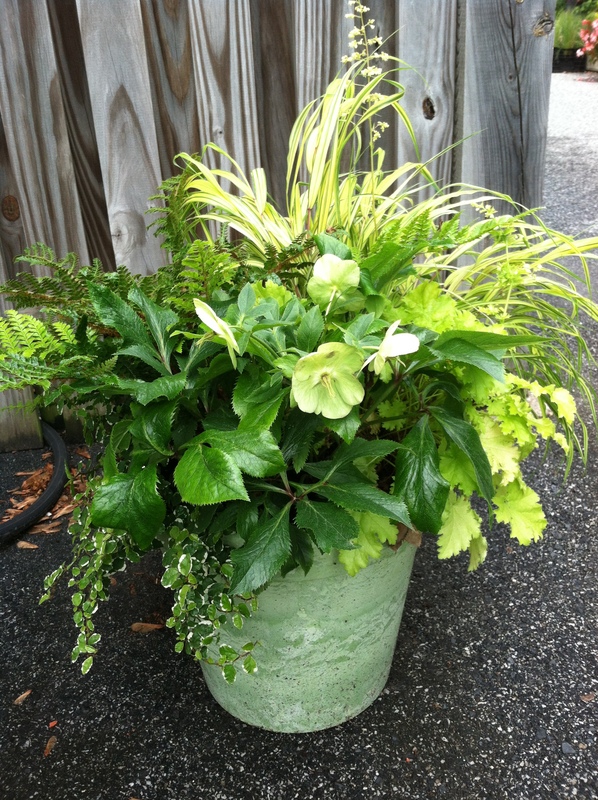 This container which is a quiet study of leaf shapes and textures, has Hakonechloa ‘All Gold’, Helleborus, Ferns, Creeping Variegated Fig, and a gold Coleus. For shade only, this container will winter over minus the Coleus and the Fig, giving you the opportunity to add something else for next season. 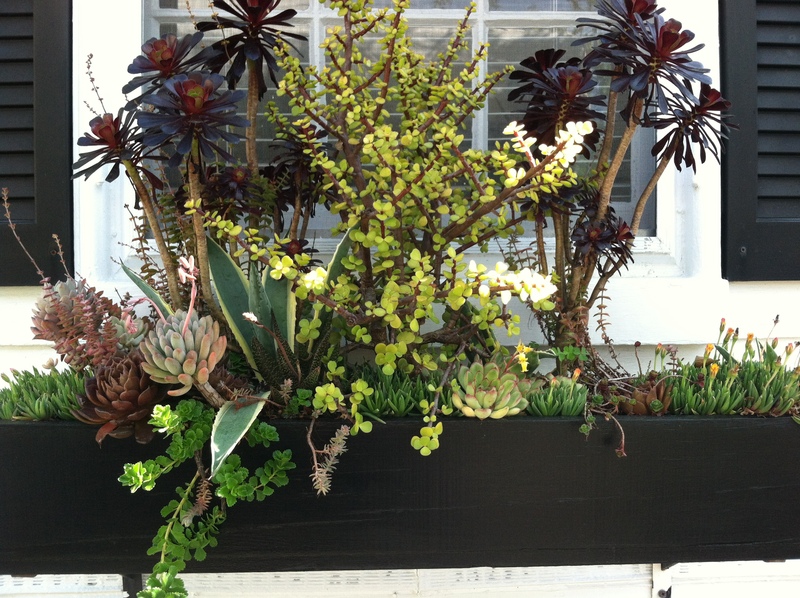 This window box is showcasing some beautiful forms and colors of succulents. You hardly have to water it and it can take full baking sun. I found this at Ladew gardens. 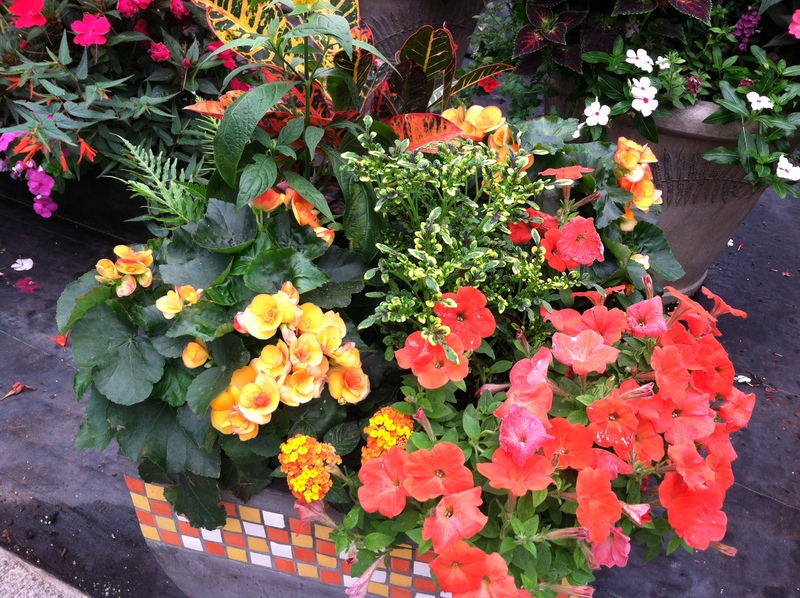 The above ‘carnival of oranges’ container has Orange Wave Petunia, Coleus, Lantana, Tuberous Begonia, Croton, Ferns, and Shrimp Plant. I wasn’t sure how this would perform in the long haul, as the Lantana, Shrimp Plant, and the Petunia like full sun, and the others like partial shade or shade. But it is a stunner. This container is playing off the reds and burgundies with a touch of white and yellow. 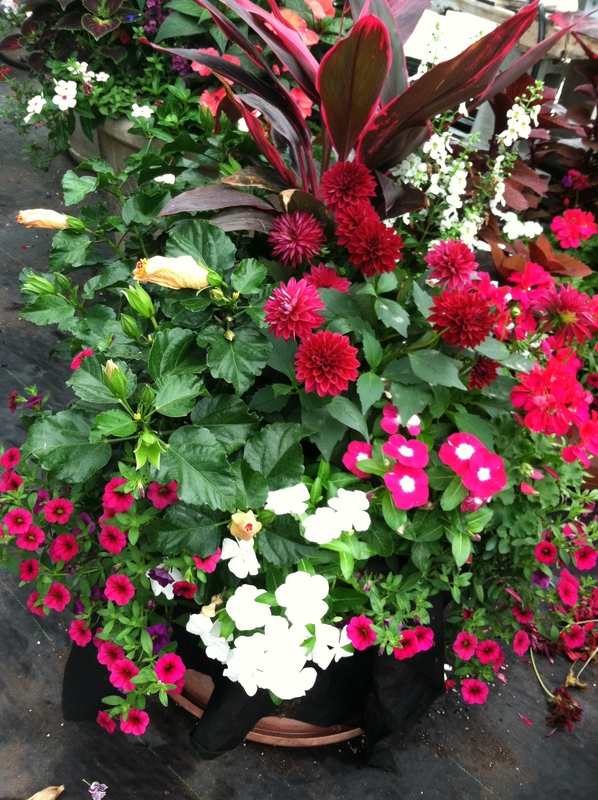 Calibrachia, Vinca, Dahlia, Hibiscus, Cordyline, and Angelonia are included to make this a full sun containers. The designer chose a plant with visual punch, which is the beautiful pink-edged Cordyline, and built the plants around it, echoing those colors. A splash of white adds contrast. 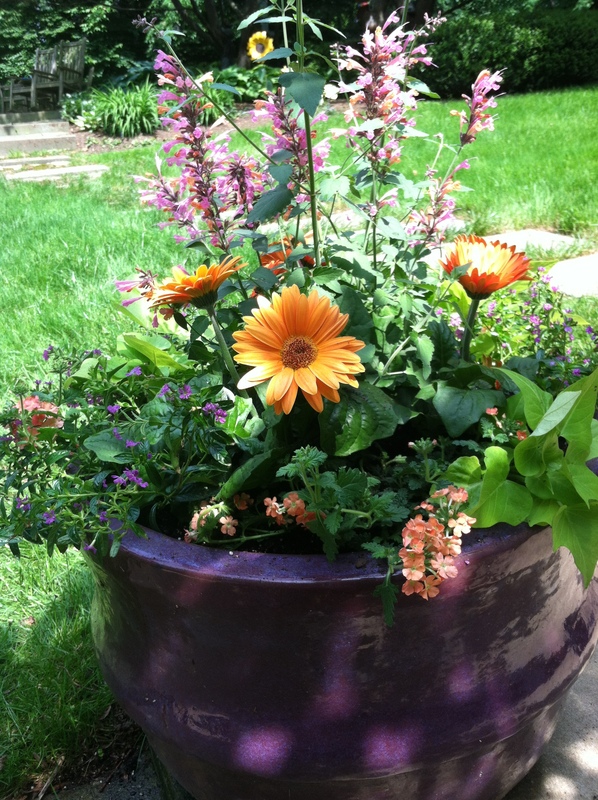 Purple is an uncommon color for a container and this pot was amped up a notch with orange flowers. Gerber Daisy, Agastache, Peach Verbena, Sweet Potato Vine, and I think the small pink flower is Mexican Heather or Lobelia, were combined to make a statement. Full sun is required, and the Gerber Daisy does require cleaning of the old blooms to continue it’s show. This combo has structure, texture, and movement. Beautiful! The secret to combining the right plants in a container, is to use good color contrast, by picking up the leaf, stem, flower, or container color. Another important element is to vary the form of the plants. Always start with something bold and architectural, like a cordyline, croton, canna, or papyrus, and combine with finer textured plants. 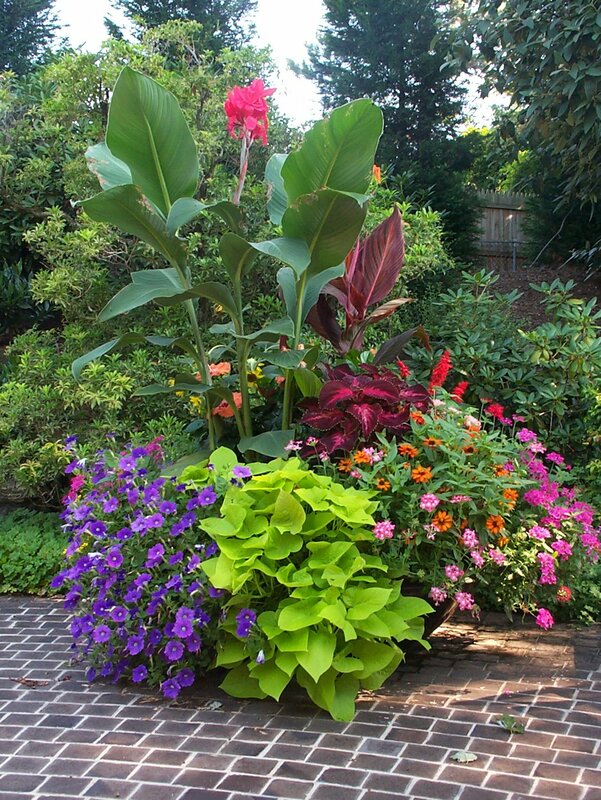 Three to five plants is usually enough variety or the container can get too busy. Avoid a rainbow of colors for the same reason. The container which I did below has a rainbow of colors, so I broke the rules on that! But seriously, there are guidelines, but in the end, experiment and make your own statement with what you select. Try to select plants that will survive the environmental stressors of wind, pounding rain, and extreme heat. 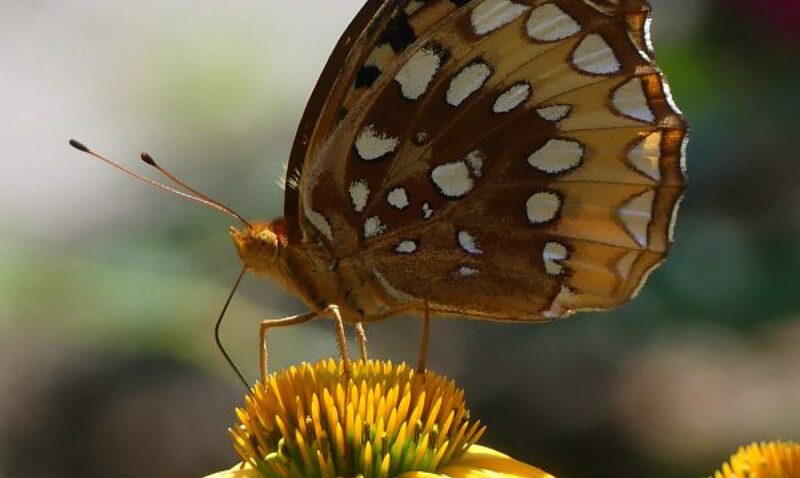 My advice to get these beautiful results is go to a nursery and pick a strong, structural plant that you love, and try different plants next to it at the nursery. Keep in mind the light requirements when gathering your finds, and it is like picking flowers for a beautiful bouquet. Claire…I needed this post….I have some containers on my deck – but, never filled them up so that the plants overflow it…..I love seeing them falling out over the rim of the containers….I am off to the nursery to add to the tapestry….thanks for sharing…. Thanks Maria. I am sure you are as artistic with your containers as you are at cooking! Claire, Thanks for including me in your “related articles.” I’ll have to post some new pictures of that pot, as well as my others. However, they pale in comparison to some of the beauties you highlighted. I learn still have so much to learn. The great thing is I have so much fun doing it! I am always learning also. Blogging really is an education! Please do, and if you want to get it in your email ( I post about twice a week) just click on follow! Previous PostPrevious Grafted Tomatoes-What’s Next? ?